We are pleased to announce the winner and honorable mention for the 2018 contest. 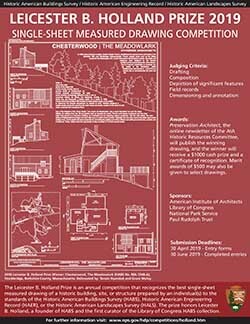 The Leicester B. Holland Prize is an annual competition that recognizes the best single-sheet measured drawing of an historic building, site, or structure prepared by an individual(s) to the standards of the Historic American Buildings Survey (HABS), Historic American Engineering Record (HAER), or the Historic American Landscapes Survey (HALS). The prize is supported by the Paul Rudolph Trust, the American Institute of Architects, and the Center for Architecture, Design, and Engineering at the Library of Congress, and is administered by the Heritage Documentation Programs of the National Park Service (HABS/HAER/HALS). The prize honors Leicester B. Holland (1882-1952), FAIA, chairman of the AIA's Committee on Historic Buildings, head of the Fine Arts Division of the Library of Congress, first curator of the HABS collection, co-founder of the HABS program in the 1930s, and the first chair of the HABS Advisory Board. The prize is intended to increase awareness, knowledge, and appreciation of historic sites, structures, and landscapes throughout the United States while adding to the permanent HABS, HAER, and HALS collection at the Library of Congress, and to encourage the submission of drawings among professionals and students. The prize is also intended to reinvigorate the art of architectural delineation and composition in the tradition established by the Ecole des Beaux Arts. Beaux Arts methodology embraced the study and drawing of historic buildings as a crucial component of architectural education, providing an opportunity for young architects to gain an understanding of the principles of design and construction. Additionally, it was a means through which architects mined historic buildings for architectural motifs to be used in their restoration and new design projects. By requiring only a single sheet, the competition challenges the delineator to capture the essence of the site through the presentation of key features that reflect its historic and its architectural, landscape architectural or engineering significance. The Holland Prize competition is open to all those interested, regardless of experience or professional background. The winner will receive a $1000 cash prize and a certificate of recognition. Preservation Architect, the online newsletter of the American Institute of Architects Historic Resources Committee, will publish the winning drawing. Merit awards may also be given.